I’m a bit of a tinkerer. In fact I made and sold thousands of alcohol stoves over the years while operating End2End Trail Supply. Wood burning sheet metal stoves, no problem. Anything metal was my forte. 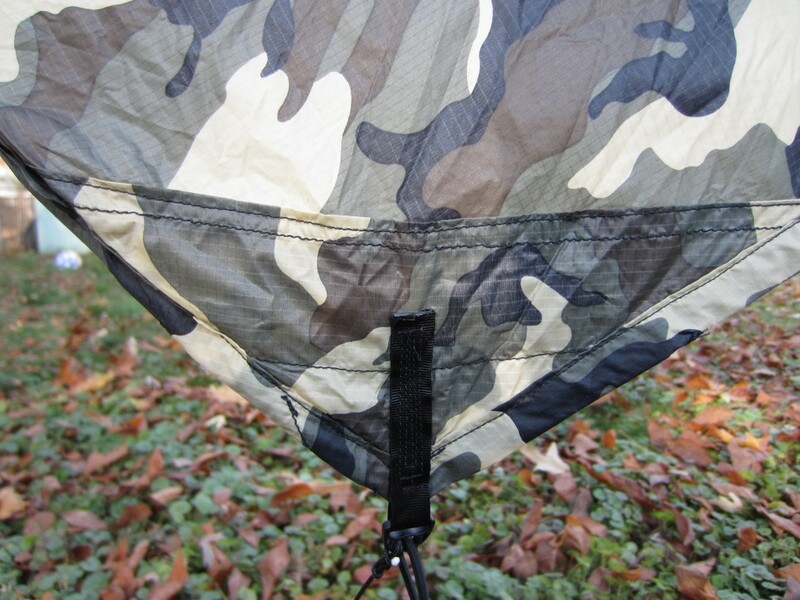 Even so, I always admired anyone who could create something from fabric.I never thought I would be able to sew projects like the folks at Hammock Forums and Backpackinglight. I decided to give it a go and bought myself the above pictured Brother xl2600i for my birthday a few years ago, and then it sat, probably mostly due to my lack of confidence. I visited my good friend John Donewar back in March and saw his projects and sewing space and finally decided to give it a go this past July. Now I’m bitten by the DIY bug and I’m here to say if I can do it so can you. I started out making stuff sacks and small (pin cushion size) pillows, and there’s a good reason why folks start out with these simple projects – you get familiar with the machine and how to sew a straight stitch. In fact, 90% of the DIY projects out there just call for the ability to sew in a straight line. 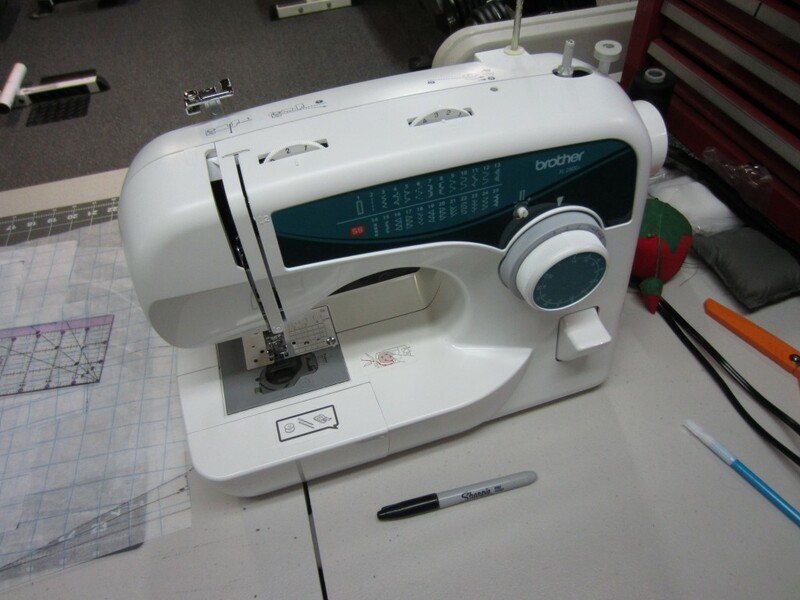 In my opinion learning the functions of the machine and why it might not sew properly were tougher than actually sewing (hint: most of the problems I came across were from improper top tension and improperly wound bobbins). Once I got the hang of it, sewing became quite cathartic. I become absorbed by the hum of the machine and the flow of the fabric. I will outline some of my projects to date, and include any links I think are applicable. 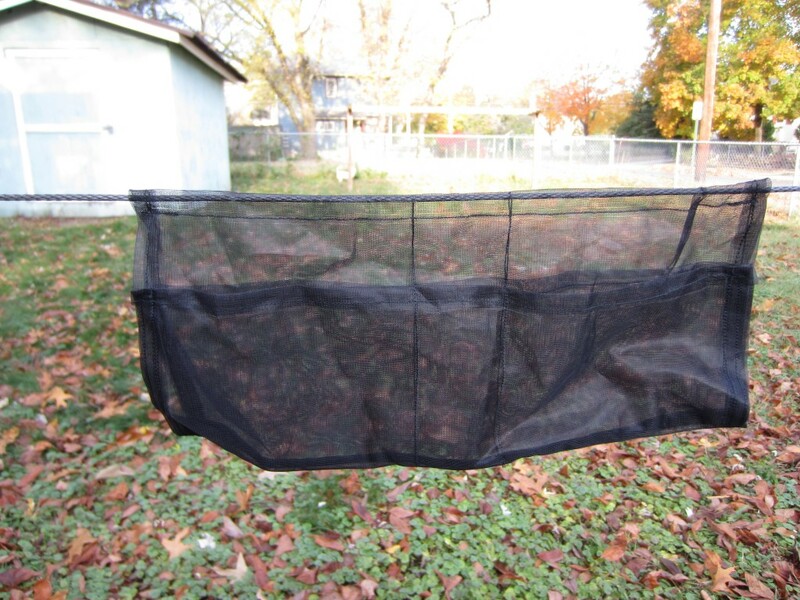 My first project of any real size was a bug net affectionately know as the Fronkey Bug Net, named after it’s creator Fronkey, of course! 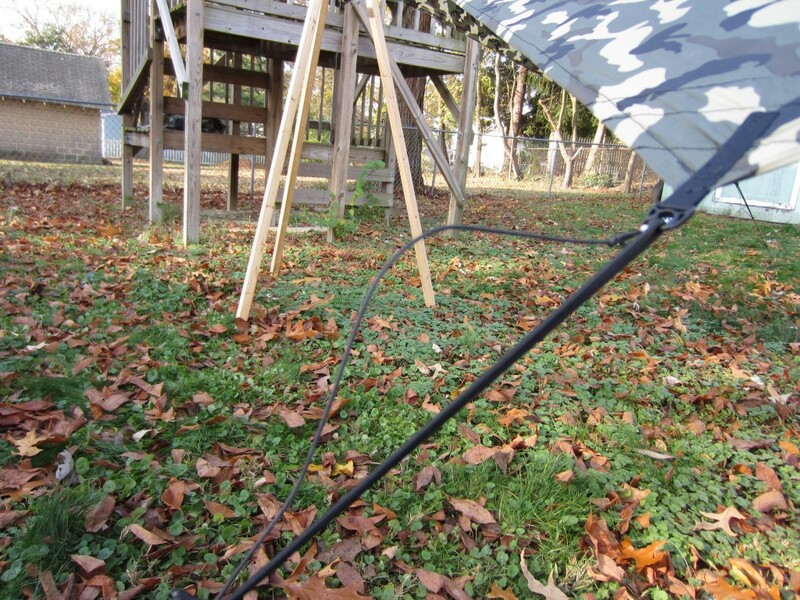 I bought the no see um from DIY Gear Supply, and the design is basically a hem at the bottom for a length of shock cord, and a couple of hems up the side. Best of all, I finished it in about a half an hour! Final weight came in at 7.3 ounces, including stuff sack. 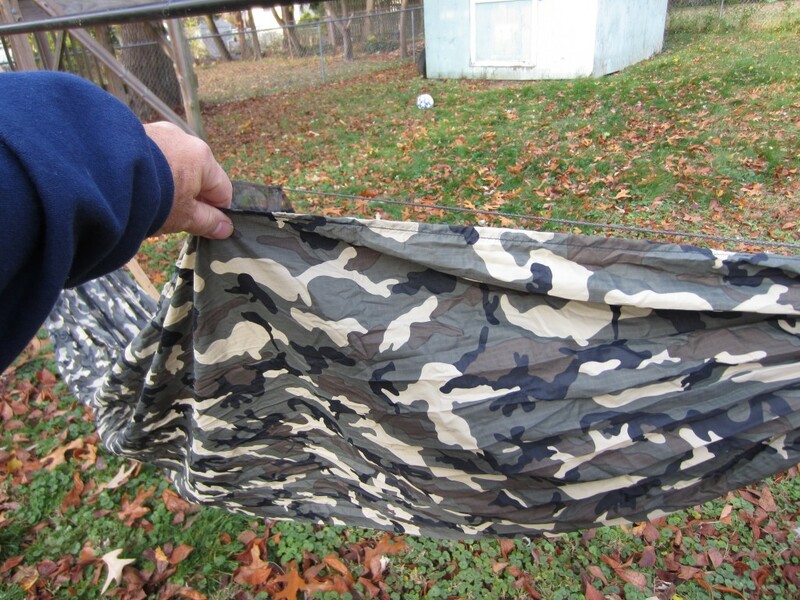 By now I had become obsessed with a camo hammock setup, and decided to knock off a camo Asym style tarp made from some 1.1 silnylon I purchased from Ripstop By The Roll. Using a pattern found at DIY Gear Supply this project was a breeze! 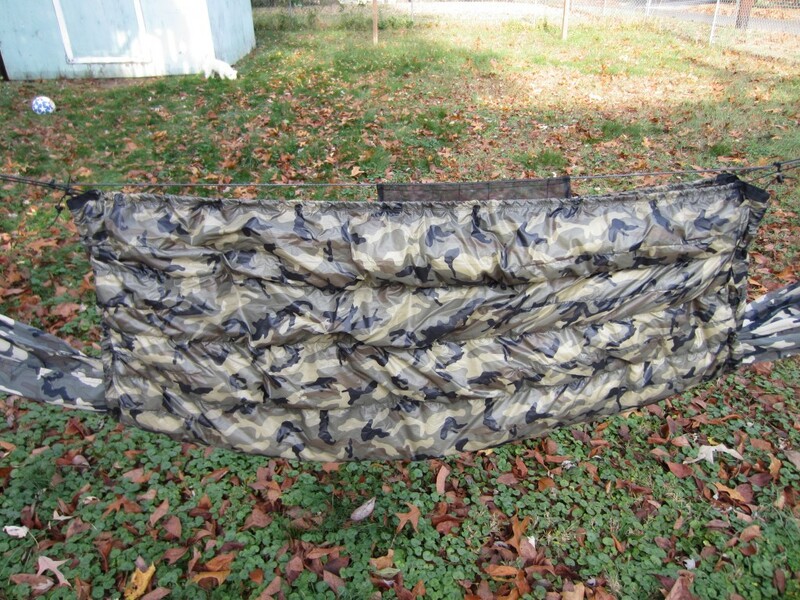 With stuff sack, ridgeline, and guylines with self tensioners the tarp setup weighs 6.8 ounces. 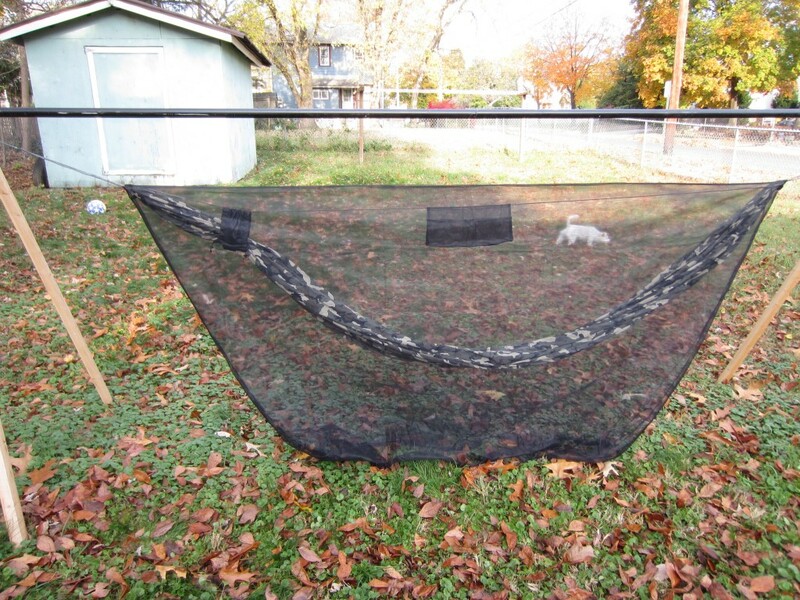 Throw in a couple of MSR groundhog stakes and the kit weighs 7.8 ounces. 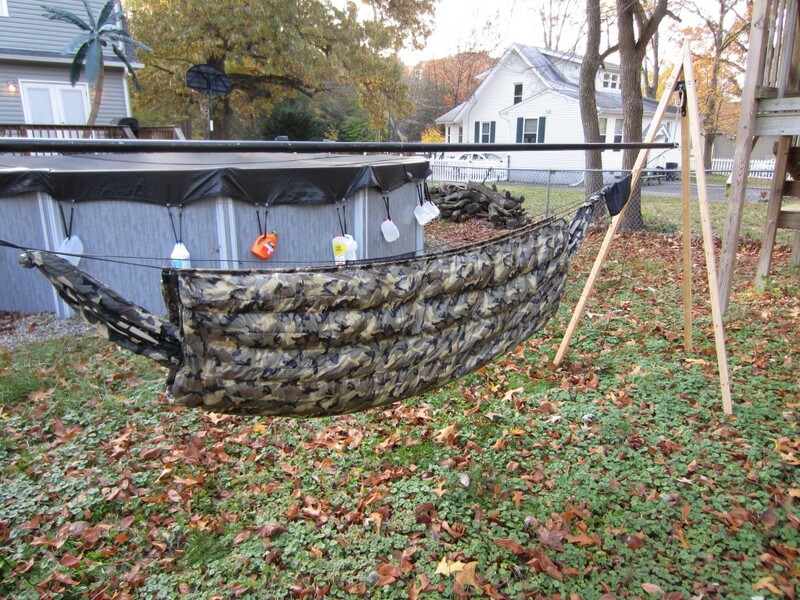 Well, what good is a camo tarp without a camo hammock, so I tapped Dutch over at Dutchware for some Argon 1.6 fabric. 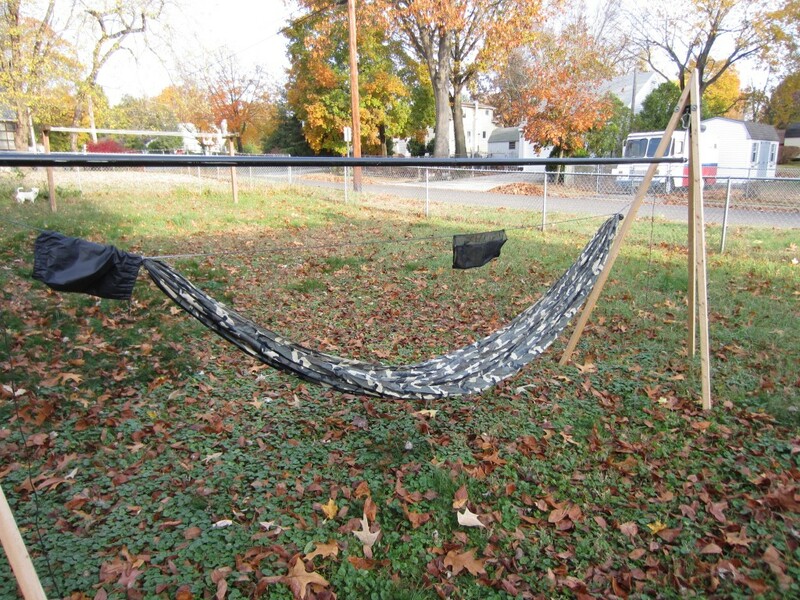 Once again, just a few straight seams and the hammock body was done. 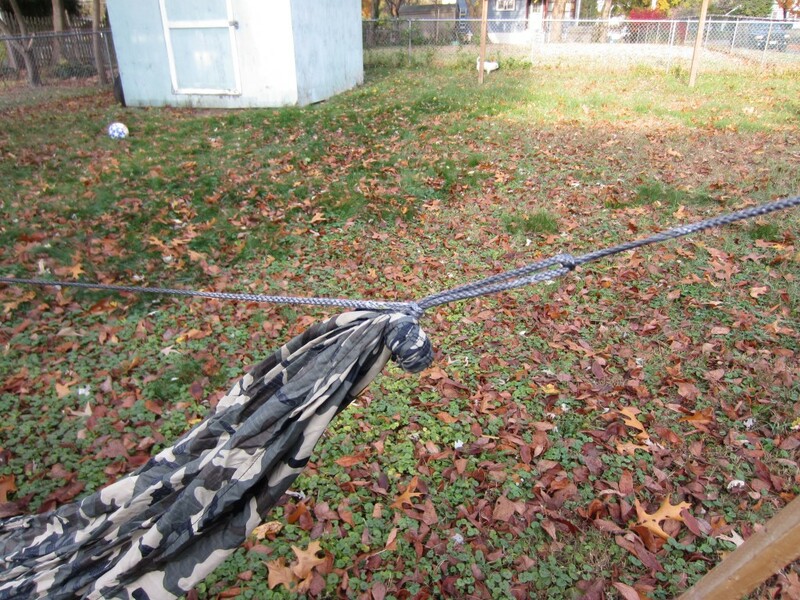 The ridgeline and whoopie sling suspension was made from 7/64″ Amsteel from Redden Marine, the toggles were cut from aluminum arrow shafts, and the camo 1″ webbing for the tree huggers came from Dutchware as well. I whipped up a bishop bag (basically a stuff sack with openings on both ends) from some Momentum 90 I had laying around and viola, she is fini. Or so I thought. 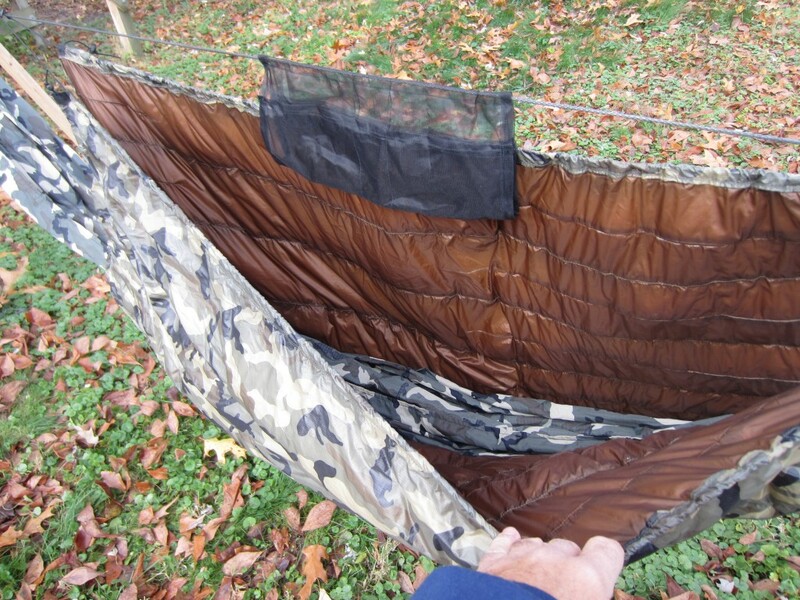 That’s when I decided to sew up a ridgeline organizer, ala Dream Hammock. I like the idea that I can slide a water bottle in the middle so I don’t have to fumble in the dark. The weight of my whole hammock rig including hammock, ridgeline, whoopies, toggles, tree straps, ridgeline organizer and bishop bag comes in at 15.7 ounces. By now my skills were improving and I took on a project that I must admit I was quite nervous about – a down under quilt. 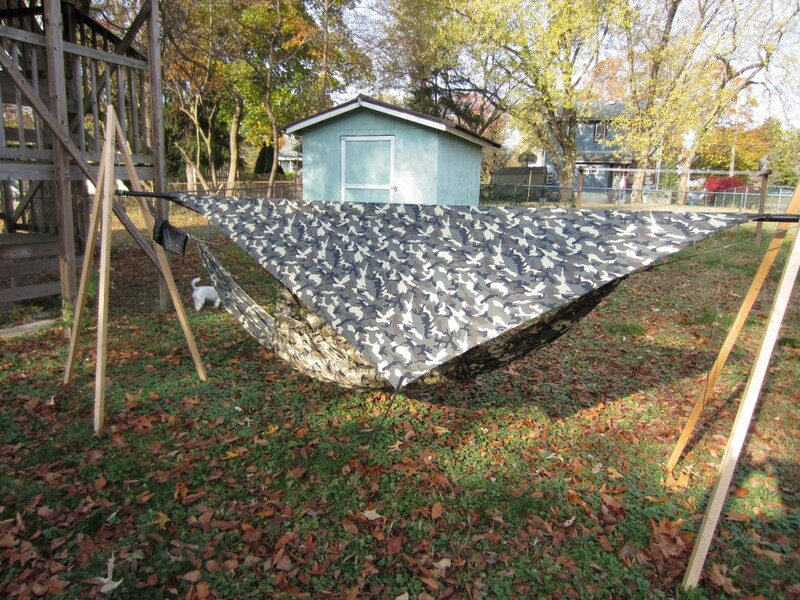 I love my Hammock Gear under quilts, and was going to pay for a custom super ultra light summer UQ to go with my 50° top quilt, but I thought, “why not give it a try”. 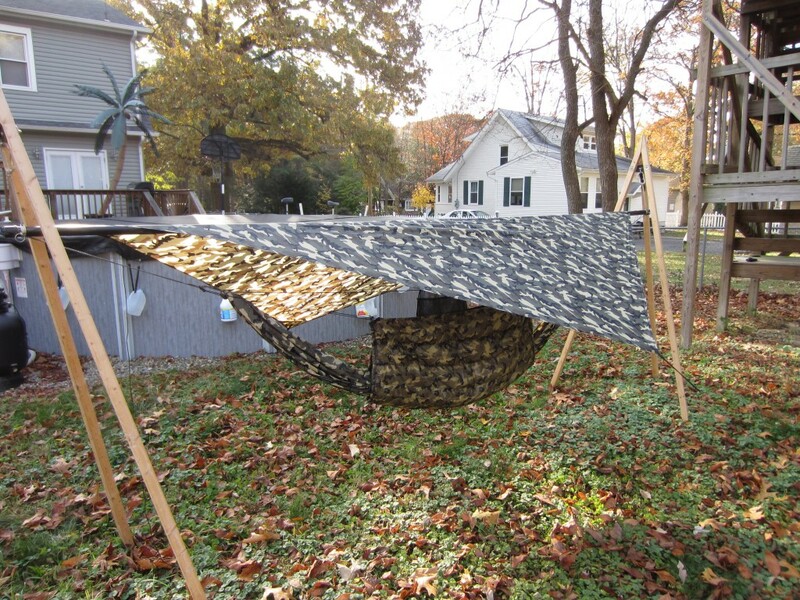 I found a very detailed description of an under quilt someone had made at hammock forums, and decided it didn’t look all that bad. 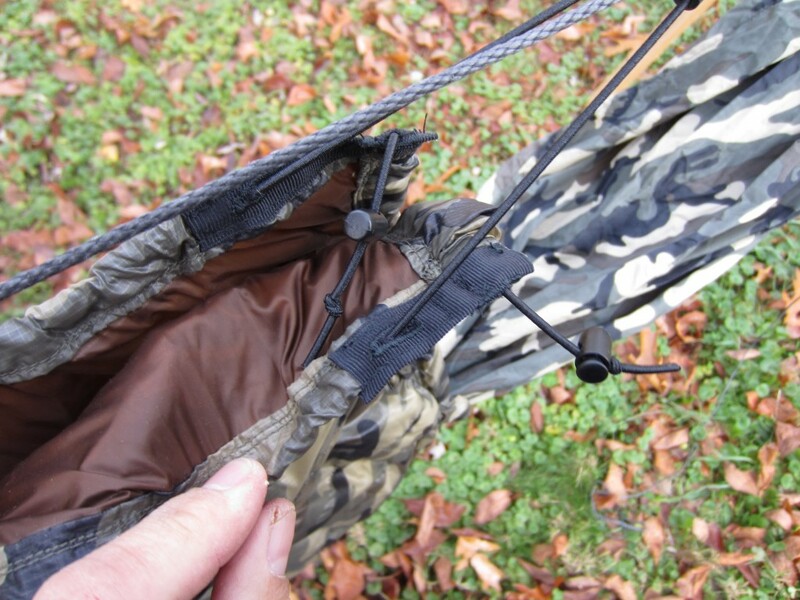 Once again I tapped Dutch for some Argon 67 in Coyote Brown for the inner shell, and Argon 90 in camo for the outer. 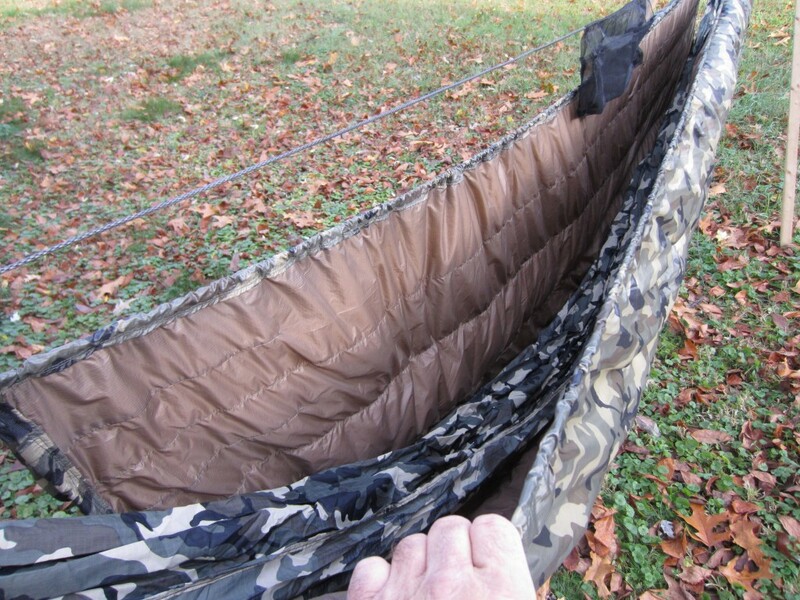 I went with 1″ baffles and 3 ounces of down, and according to Catsplat’s UQ Calculator my under quilt should be good down to 51°. I slept in it shortly after finishing, and it got down to 52°, which kept me plenty warm sleeping in only sweat pants and a tee shirt. Best of all it only weighs 8.5 ounces! Shortly after finishing my UQ my buddy Matt asked if I would make him a full length 20° UQ in the same colors as mine. I challenged myself and was able to make it in one day! Whew! I made it from Argon 90 inside and out and filled it with 11.5 ounces of 850 fp down. It weighed in at 20.6 ounces and should be good to 19°. So far Matt’s tests have given a big thumbs up! Now if I can get Paul’s UQ done I can get on to making my silnylon rain gear, heh heh.